snakecatchers.com.au provides our Australian snake identification service free of charge and always welcome high quality images for potential inclusion on our website. This service is not just for Queensland snake identification but for all snake ID across Australia. Please Note we are unable to provide snake identification from other countries. Please read the notes below then fill in the form below. To have the best chance to identify a snake from a photo, please try to provide the best photo possible i.e. not blurry and not to small. We understand that photos are often taken under extreme circumstances and often under poor conditions. If this is all you have. We will try our best in identifying the snake for you. Remember DO NOT place yourself in danger trying to obtain a photo. The answer provided by this service is advise only and is provided from the photo sent. Proper identification can only be given if we are able to visually see the snake. While every effort is used to identify the snake in your photo correctly, all snakes should be considered dangerous and left alone unless moved by a licensed snake catcher. 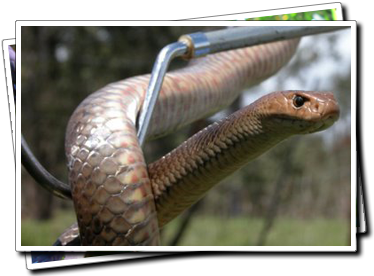 All snake bites should be treated as venomous especially in the absence of reliable identification and first aid action should be applied immediately with Pressure Immobilisation Bandaging and call 000. * At least 1 attachment is required.